The Japanese calendar of annual events has gone through many changes over the centuries, with certain customs variously having been added, forgotten, or transformed into something unrecognizably different from what they started out as. And while the origins and evolution of many of Japan’s most famous NENCHUGYOJI (年中行事、traditional annual events) remain obscured by the veil of their antiquity (by Japanese standards), the rise of one new, but now already widely established custom, occurred in the full light of the Late Showa Period (the late 70s-late 80s), and can be traced in great detail. I am talking about White Day, the UNIQUE answer which arose to Japan’s UNIQUE way of celebrating Valentine’s Day, in which WOMEN give gifts (usually chocolate), not only to one SPECIAL SOMEONE or male family members, but (also) to several (or numerous) classmates, colleagues, teachers, etc. On White Day, which falls exactly one month later, on March 14th, the men who have received their Valentine’s chocolate are expected to give OKAESHI, a gift in return, which most commonly consists of marshmallows, chocolate, cookies, or cakes (usually white, or at least light colored), and which as SPECIAL gifts to THAT SOMEONE SPECIAL might take the form of flowers or even lingerie (white, of course! ). 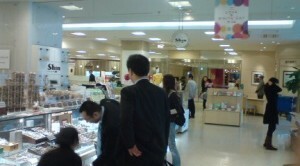 That is why, this week, you will notice a difference in the look of the average shopper at Seibu Department Store’s ground floor food section. Until the store closes its doors on Saturday the 14th, there will be an ever increasing preponderance of men in suits, or older men — well, just plenty of men in general — types who are not usually spotted in groups food shopping at department stores in Japan. These gentlemen, under pressure, have a daunting task ahead of them: deciding, out of all the possible choices of cakes, cookies and chocolates available at the specially set up, temporary White Day counters, which to purchase as White Day gifts. You might notice that some older men even bring their wives along to help them decide. These women are not picking out sweets for their husbands mistresses (though a few might be!). 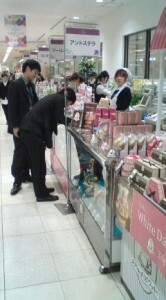 They are selecting the proper OKAESHI for all the chocolates their husbands received at work. Not returning the gifts would more than likely mean not getting chocolate from the snubbed person next year, and in contemporary Japan, the amount of Valentine’s chocolate one gets is a point of pride. Besides, for the Japanese, OKAESHI is an important part of all social relations in Japan, and not returning a gift would be considered thoughtless or even insulting in some situations. That is why, considering the one-way, woman to man, Valentine’s Day which has developed in Japan, it is not strange at all that a day like White Day came into being. The only question for me is, why did it take so long? It took 5 years of perseverance and close cooperation between various confectioners before a chord was struck with the general population’s deeply ingrained sense of GIRI (obligation) and the commonly held view that all gifts should be returned. It was only in 1978, more than 10 years after Valentines Day had become a part of Japanese life, that the 3rd generation owner of Fukuoka City’s Ishimura Manseido (石村萬盛堂) Confectionery Shop asked the same question in a letter to the editor of a women’s magazine. Why was there no OKAESHI for the gifts given on Valentine’s Day? He recommended that marshmallows be a feature of any sweet given on the day that he suggested be called Marshmallow Day. It was not until the next year that a group of confectioners got together to promote this new idea, and came up with the name White Day. In June 1979, a meeting of the the All Japan Sweets and Confectionery Makers Union (全国飴菓子工業同組合) convened in Nagoya and decided to go ahead with a White Day Campaign, which would be implemented in 1981. The advertising campaign was a big success in the first year, with excellent sales for many of the products which were promoted. For the next 4 years, however, things went downhill. By the fifth year of White Day campaigning, the group of organizers was ready to call it quits. They decided to make one last effort. That year, 1986, which was meant as one last try at success, proved to be the turning point in making White Day a regular NENCHUGYOJI. 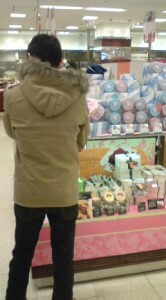 In fact, that year ,there was not enough supply to meet the demand for White Day products. Profits exceeded 5.5 billion yen. Well, for better or for worse, that’s how we got White Day. So guys, don’t forget. In Japan, its always give and take. If you don’t give back, you don’t get no more! Happy shopping! Zakumata, Y-shaped sticks placed at cross-roads are a unique way of praying for EASY DELIVERY!